Dubai, UAE, April 15, 2019: In a history of trade routes that connects the East and West, Manzil Downtown takes you along The Silk route by land through an unforgettable Iftar. The Iftar featuring an inspiring spread of cuisines from across Europe, Asia and Africa will be on offer. Connect with different traditions and witness the influence of the routes on your Iftar table. Set in a contemporary Arabesque lounge and courtyard, enjoy an exquisite menu, parade along with live-cooking stops whilst the strings of the instrument plays to the sounds of your journey. Enjoy the open sky and a delightful Suhour that will transport you to The Silk Route. During this spiritual gathering with family, friends and all who are dear to you, taste the chef’s special creations of petit meals inspired by the legendary Silk Road. 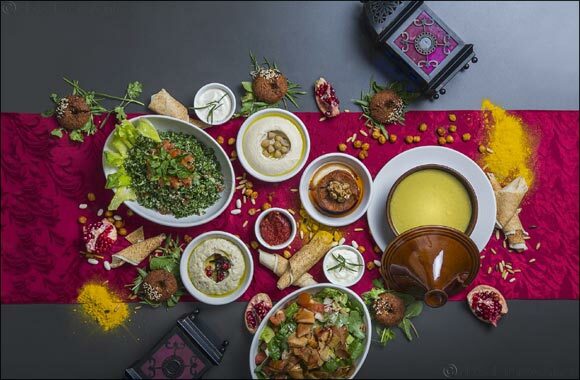 Immerse yourself in the spirit of the holy month with a special Middle Eastern menu at Manzil Downtown. As the magic of the al fresco surroundings envelops you, partake in sweet and savoury treats and share meaningful moments with your colleagues, partners and their families. Set in a contemporary Arabesque lounge and courtyard, enjoy an exquisite menu parade along with live-cooking stops whilst the strings of the instrument plays to the sounds of your journey.